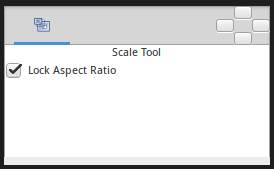 The "Scale Tool" permit to scale the selected handles. It works much like to Transform Tool except for when multiple Handles are selected. Then drag one of the selected Handles. All the selected Handles will be scaled relative to the center of the selected group. When scaling a selection don't drag a Handle that its position is close to the X or Y center of the bounding box. Select a Handle that is close to one of the corners of the bounding box. If you drag from a Handle that have a X or Y coordinate that is the same than the center of the bounding box it would produce an infinite scale factor and a very difficult to control scaled shape. (The Handles that aren't over the bounding box X or Y center are scaled by a huge factor). This is a behavior that should be corrected (for example giving to the user corner pulling anchors to allow make a correct scaling). This page was last modified on 7 March 2016, at 19:29.